The newly renovated Shively Library is now open. To learn more about this project and to see photos of the branch, click here. From the Watterson - Take the Watterson (I-264) westbound to the Shively exit; you'll be heading north on Dixie Hwy. when you come off the ramp. Stay in the left lane on Dixie for approximately 1 miles. Turn left at the third light, which is Park Drive; immediately take a right into the parking lot. The library is located in the Shively City Hall Building at 3920 Dixie Hwy. The library has a WWII army tank in front of the building and is across the street from both Burger King and Super America. From Seventh St. Rd. (Manslick side) - Follow Seventh Street Road south to Southland Terrace Shopping Center. Take a right on Park Drive immediately after Krispy-Kreme. Go straight through the next light (Dixie Highway) then take an immediate right into the library parking lot. From Seventh St. Rd. (Algonquin side) - Take Seventh to the Seventh/Berry intersection. Turn right onto Seventh. Stay on Seventh until you see the Krispy-Kreme doughnut shop. Take a right onto Park Drive immediately after the Krispy-Kreme. Go straight through the next light (Dixie Highway) then take an immediate right into the library parking lot. From Crums Ln. - Turn north onto Dixie Hwy keeping Walgreen’s on your left. Take a left at the next light (onto Park Dr.), then immediate right into the parking lot. Total mi: about 1/2-1 mile. Like so many other branches of the Louisville Free Public Library system, the Shively Branch was born from a mixture of community necessity and civic generosity. In 1942, at the urging of Councilwoman Pauline Hardy and with the assistance of LFPL, the Shively City Council approved $5,000 to establish a library for the city of Shively. The library was first located at the Bank of St. Helen's and was later moved to the home of Mary Diersing at 3937 Dixie Hwy., to a room that was used previously for a post office. Adele Beyer became the first librarian. The city of Shively paid $25,000 for the library to be housed in a portion of the Newman Memorial Building (now called the Shively City Hall), built in 1959 by local contractor, Al J. Schneider. The memorial building, where the library is still located, was named after the Rev. Joseph A. Newman, a well-known pastor in Shively and head of the St. Helen's Church community for many years. Newman was extremely active in the library, and his work stood out so much that his name was added to the branch also that year. In 1964, during the tenure of Shively Mayor John Celletti, it was decided that the library join the Louisville library system, thus becoming the Shively-Newman Branch of the Louisville Free Public Library. 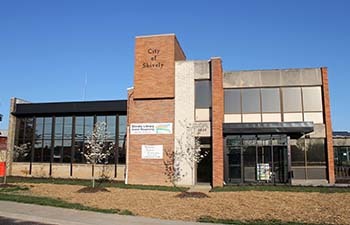 In 1990, during the tenure of Shively Mayor William S. O'Daniel, the library expanded into the auditorium of Shively City Hall. This latest addition to the Shively Branch today houses the fiction collection of books and books on cassette and CD. During the early 1990s, former mayor James Jenkins served on the LFPL Advisory Council, continuing the tradition of City of Shively support for a neighborhood library. The Shively Branch remains a vital part of the Shively community, providing library materials, programming for children and adults, computer access, and homebound services to its residents.